The broad outline of the story makes it sound like a dark piece of horror: a man becomes consumed with murderous revenge, but when his revenge is spoiled (seemingly forever), he turns his frustration to a series of basically random victims. But Burton infuses so much quirk into the story that it becomes almost a rollicking good time. 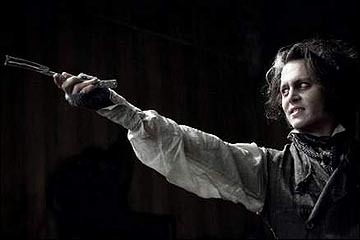 He is helped immensely by Johnny Depp in the lead role as a man who has fostered years of frustration into a murderous rage only to discover that as long as his real target eludes him, no amount of murder seems to make him feel any better. Even when during the 2nd act Todd has collapsed into a vacuous, apathetic depression, Depp and Burton manage to make it a funny depression. Helena Bonham Carter plays Todd's counterpart and willing instigator of their new business venture. She's very good as a woman who is just a couple degrees off kilter, and who sees the world so pragmatically that it only makes logical sense that the best way to dispose of murder victims is by making them into meat pies--what with the price of meat being what it is nowadays. She also has a sense of barely controlled desperation to her. She is (and has likely always been) in love with Todd and would do anything to keep him nearby. Anything. Despite the fact that he is so fixated on his goal (and later so despondent about not being able to achieve it) that he hardly even glances at her. Many good, quirky performances round out the movie: Alan Rickman is slimy and creepy as Judge Turpin, the much-too-old man lusting after the little girl. Sacha Baron Cohen gets one of the biggest laughs in the movie just by appearing on screen. Timothy Spall is piggish and revolting as Rickman's right-hand man. The only two performances that fall comparatively flat are the two young "in-love" leads. They're both just so normal that they get drowned out by all the weirdness around them. Sweeny Todd is a musical, yes. It has a lot of songs in it, but they're mostly enjoyable and often very, very short. Being written by Sondheim, the musical themes come and go throughout the story, with songs being reprised and reworked in different ways throughout the film. The most enjoyable number for me was the "Little Priest" song, in which Todd and Mrs. Lovett convince themselves that it would be okay to become cannibals. I also enjoyed Mrs. Lovett's fantasy about living happily ever after with Todd. Unfortunately I can't recall hardly any of the melodies from any of the other songs. Neither Depp nor Carter are professional singers, but they're able to sing in-character, and let's face it: these characters would sound wrong if they had perfect singing voices. In fact, the kid that they rescue from Sacha Baron Cohen's character has a singing voice that is so astronomically better than the leads' that it stands out and doesn't mesh at all with the movie. The art direction by Scorsese collaborator Dante Ferretti (who also art-directed two of my favorite-looking films: The Adventures of Baron Muchausen and Titus) transforms Olde London into a nightmare fantasy of brick and stone. Honestly, after watching this movie I never wanted to step foot into a building made out of brick again. It's also a very gory London, with lots of blood geysers in the style of Lone Wolf & Cub. In context, the gore is rather cartoony and often played for laughs rather than horror. So it's a very enjoyable movie, but it was just missing that special oomph to push it up to four stars for me. I think the fact that the three lead characters (Todd, Lovett, and Turpin) are rather unsympathetic had something to do with it. Tim Burton has been experimenting quite a bit in the past ten years or so with unlikeable main characters in his movies (Mars Attacks, Sleepy Hollow, Planet of the Apes, Charlie & The Chocolate Factory), and this film continues the trend. The movie was basically horrible people doing horrible things to each other for its full running time, and as such could never rise much above morbid fascination to become a genuinely moving experience.